Now that the sentimental season of Christmas has come and gone, we can revisit the real story for a harsh reminder of the violent grace that saved us. Jesus' coming to earth was not wanted or appreciated by those in power. If Mary's burst of praise was not incendiary enough for the rich power brokers of the day (Luke 1:46-55), the Magi's declaration of Jesus as King of the Jews made the ever-paranoid and always-murderous Herod livid (Matthew 2:1-3; Matthew 2:13). 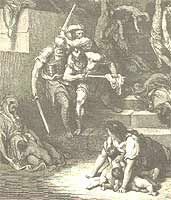 Herod had killed his own children and relatives to protect his power. Slaughtering some innocent children who lived in the shadow of one of his favorite get away palaces didn't even require the blink of an eye. Herod's reign as King was marked by blood and buildings. Jesus' birth fits the Herod profile! It is almost too real to bear. While we will never know for certain, I have often wondered what Mary thought when she heard ... heard that they slaughtered all those toddlers when her son was the target ... when she heard that they showed no mercy when looking for her young son ... when she realized that being the mother of the Son of God was not only wondrous, but also horrifically dangerous. When a royal foreign delegation comes to inaugurate some baby as King and bring him gifts for his royal coronation to the palace of Herod, the vicious king cannot help but see a plot afoot to dethrone him. Yes, Jerusalem wasn't too far away and such news and Herod's feared reaction would have put the entire city on alert (Matthew 2:3). Herod reacted with all the violent heavy-handedness that he always did. Blood would flow and enemies would die. That was Herod's solution to everything. This awful story reminds you and me of several important truths about our Lord, the gospel that saves us, and the horrible nature of our world. First, Jesus faces a violent future with those in power — Jesus is God's Messiah and Lord, but not the establishment's Messiah or Lord. Jesus' birth fits the Herod profile! Second, we see that those in power will do anything they can to silence Jesus in seeking to prevent him from fulfilling his roll, while never realizing that their jealously and hatred will lead them to just that — fulfill God's plan for saving us. Third, children, as they so often do, are the ones caught in the crossfire and discarded like paper dolls and left to die on the streets of the city of the great King David. No wonder Jesus had such a profound affection for them. These lifeless and innocent children of Bethlehem also prophetically speak to the murder, at the hands of Herod and the Romans, of an even greater David, God's real King. So now that the gifts have all been given, the returns have largely been made, families have all gone home ... pause for a minute, strip away the sentimentality of the stories, and go read the first two chapters of Matthew and Luke again. Listen for the grittier, more real, and truer to life Jesus that is there. When John literally says that Jesus pitched his tent among us (John 1:14), he is being more than symbolic. Jesus was never really welcomed as a citizen, but either followed as a Savior or hated as an enemy of the state. His call to follow, then, is clear. Either or. All or nothing. Lord or lunatic. When I see this harsher, more real, grittier side to the coming of the Christ, I can't but thank God for Jesus coming to earth — our broken, flawed, and violent planet — and choosing to live here with us in our real world. Because of this, we can always be sure that he knows how brutal it can be here and will always be available to offer grace and help us in our times of need (Hebrews 4:14-16). "A Violent Grace" by Phil Ware is licensed under a Creative Commons License. Heartlight encourages you to share this material with others in church bulletins, personal emails, and other non-commercial uses. Please see our Usage Guidelines for more information.